Jelastic is Java Paas (Platform as a Service) cloud for Java Server hosting. we can easily create the server instances(Tomcat, Glassfish ) and SQL Instances (MySQL, PostgreSQL) and deploy the Java Web applications. here we select servers (Tomcat, GlassFish), Database Servers (MySQL,PostgreSQL) and give the unique name of ur environment. then click create button. 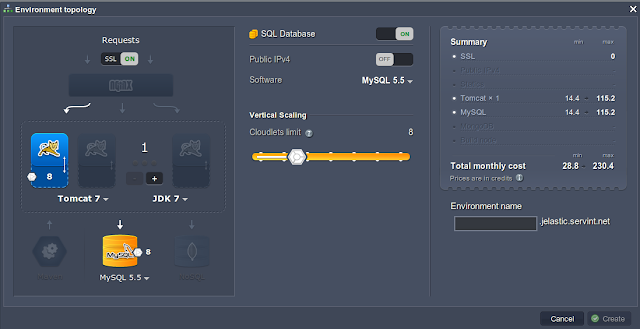 Jelastic create the tomcat and MySQL instances. these instance are not shared to others. so we can start/stop these instance at any time. we can change the config files like Tomcat (server.xml, catalina.properties), MySQL(mysql.ini) files. When we create the instances they send mail contain the user name and password for accessing the Database server. In this screen-cast (below) i deploy the previous post Jasper Report +JSF+JPA Web Application into Jelastic paas cloud.